EYE HEALTH: Opthamologist Dr Simon Skalicky suggests regular testing as a way to beat glaucoma. GLAUCOMA is an eye condition that can quietly build up over time without us knowing it's happening, until we realise we are losing our sight. Detect it early and it can be managed. Ignore the problem and your vision will slowly, irreversibly disappear. Once you reach 60, an annual screening visit to the optometrist is recommended so that your eye health can be monitored. The optometrist will check your eye pressure and look at the optic nerve at the back of your eye for any indication of the onset of glaucoma. 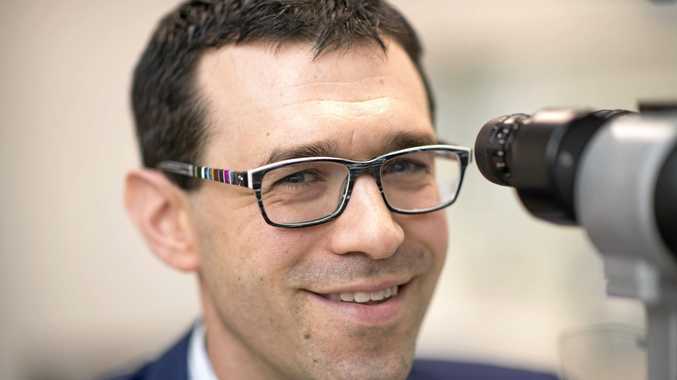 Melbourne-based ophthalmologist Dr Simon Skalicky suggests there are two other tests that might help detect glaucoma; a visual field test to check out your peripheral vision, and an OCT scan which reviews the optic nerve and can detect glaucoma earlier than changes detected in your peripheral vision. Glaucoma is where an eye's optic nerve is damaged. Inside our eyes is fluid which is constantly produced and drained. When that fluid is blocked from draining the pressure inside the eye rises and the eye becomes harder. "It's a bit like a soccer ball where you pump too much air into it; it gets firmer," Dr Skalicky explains. "That firmness damages the nerve at the back of the eye which can lead to a progressive loss of vision." The gradually increasing pressure isn't noticeable and neither is the loss of vision. But once it starts, it impacts your peripheral vision and then your central vision. This is when we notice something very wrong is happening with our vision. Optic nerve damage from glaucoma isn't reversible, but the heightened eye pressure that causes this condition can be lowered. "We can stop it from getting worse," Dr Skalicky said. Daily drops are the traditional treatment option. Another newer option is laser treatment which is a non-invasive, low risk option offered by ophthalmologists. "If those simple measures aren't enough, we can consider surgical procedures to drain the fluid from the eye," Dr Skalicky said. The newest development in surgical options available through ophthalmologists are the iStent (Glaukos) and XEN gel implant (Allergan). "The iStent can be put in at the time of cataract surgery and it lowers the eye pressure somewhat," Dr Skalicky said. The iStent is the smallest device that can be put into the body. "It's like a little stud with a hollow bore in the middle. It connects fluid from one part of the eye to the other part of the eye," Dr Skalicky explains. "There are also larger devices called XEN, which create a drain from inside the eye to outside the eye. These are permanent stents that significantly help with the eye pressure control." The XEN stent is made of collagen and looks "like a tiny, tiny tube of spaghetti" he added. "It connects from inside the eye to outside the eye, draining to under the lining of the eye." For more information, go to glaucoma.org.au.